You don’t need the tools of a pro to be DIY-savvy. In fact, your junk drawer might be holding everything you need to get started today! Among washi tape and paper bags, the humble Sharpie might be one of our favorite underrated crafting tools. Check out some of our favorite ways to craft with Sharpies. Flower pots can look painfully boring. This project will help you spruce them up with fun letters or designs that will give any garden a pop of flare. Dying Easter eggs is a fun tradition, but the dye kit from the corner store can leave these holiday eggs looking bland. This craft gives Easter eggs an artistic twist for an updated holiday. Is there a better feeling than sipping your favorite drink from cute glassware? We don’t think so. You can liven up your glassware by creating these adorable DIY wine glasses. These are the perfect accent for your next dinner party, too. Pair them with a tasty beverage, a fun playlist, and snacks galore and you have a recipe for a lively bash. No one has to know their charming glassware only took you five minutes. Even the hippest of interior designers will be green with envy when they see your pantry after this simple craft. All you need is some airtight glass jars, Sharpie paint pens, and maybe a trip to the bulk bins. The minimalism movement is really helping us budget-friendly crafters. Cute leather wallets aren’t always budget-friendly, but this DIY project is here to help. This tutorial will show you how to update a simple wallet or clutch with extra personality. Trust us, you can never have enough mugs. They’re essential home goods, perfect gifts, and they let you show off your personality. If you have a too-plain mug laying around, you can transform it into a fun and lively piece or gift it with this quick gold scalloped sharpie mug project. Up your nail art game with DIY marbled nails or other intricate designs with–you guessed it–Sharpies! Choose a classy look or go full-on gaudy–it’s all up to you. Don’t forget to show your beauties off afterwards, too. Who knows, maybe a salon will commission you. Adding personality to your wardrobe is simpler than it seems, especially with this project. Shopping can be frustrating when nothing seems to shout “ME!” Why not turn to DIY? Grab some paint pens and canvas shoes and let your creative juices flow, creating an awesome, wearable piece of art. Burlap is practically an essential when it comes to home decor, as it’s a simple-meets-chic material that goes with everything. It adds a serious amount of charm, especially in the form of holiday decor. You can add your own burlap accent with this custom printed table runner. This tutorial shows you how to make a holiday-themed runner, but this project can be customized with ease. Throwing a birthday bash? Cooking dinner for friends? Just want to spruce up your space? We’ve got you. When it comes to charming plant markers, you shouldn't skimp on creativity. You can’t go wrong with these DIY ones. These markers are simple, adorable, and functional. Add some color to your coffee table with this easy DIY project. First, head to your local art supply store for Sharpies, ceramic tiles, a glossy top coat, and some peel and stick felt backing. Grab your trusty bottle of isopropyl alcohol (you know, the stuff you use to deep clean the house) and you’re set. Simply color the tiles how you like and drip the alcohol on top for a colorful new coaster. Bring your white walls to life with this simple tribal-inspired wallpaper design. This tutorial will show you how to give your living room a fun makeover with only a few simple tools. Nothing can hold you back from your home decor dreams! Need inspiration? Look no further. This project will put your drawing skills to the test. If you’re not an artist, don’t worry. You can go as simple or complex as you like. Experiment with different colors and designs to create an impressive and customized gift. Are you constantly misplacing your rings and earrings? You’re not alone. These sleek gold-accented jewelry dishes are customized with heat transfer. Now you can keep your bling safe and easy to find. Curtains are often a forgotten form of home decor. The truth is, they can completely change the look of a room. Try this custom curtain DIY project to add a touch of flare to your home. Here ye, here ye, non-artists. If you can use a stencil, you’ll rock this craft. 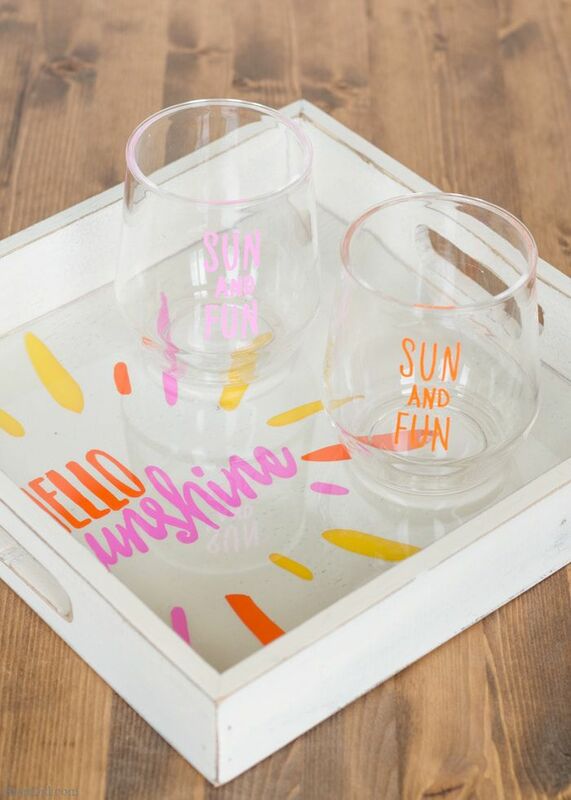 You’re sure to impress guests with these festive trays and matching glasses at your next cocktail party. Or, follow this DIYer’s advice and host your own Sharpie craft-making party using this tutorial. Update a white pillowcase with this easy DIY project. This inky blue pattern made with rubbing alcohol and a black sharpie will add a stylish element to your bedroom. You can even apply this method to make a unique T-shirt or cloth napkin.